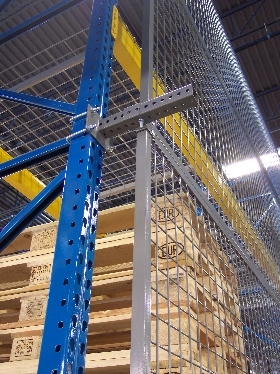 How do you secure individual or strategic runs of warehouse pallet rack systems? 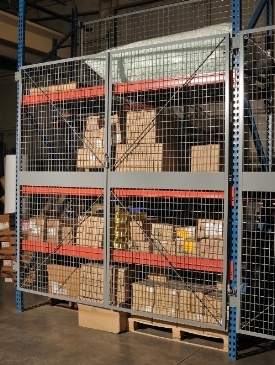 Rack Safety Systems, including pallet rack doors or pallet rack enclosures provide essential safety for your pallet racks and shelving with simple, yet durable design - Helping to keep your employees safe and productive. 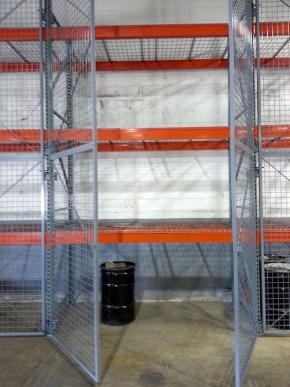 Pallet Rack Security Enclosures not only help prevent costly accidents in and around your pallet racks and shelving, it also secures pilpherable & high value product. 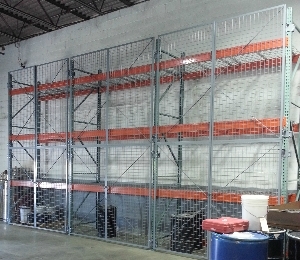 Standard enclosures are readily available for quick shipment in 36", 48" and 60" heights and 84", 96", 108", 120", and 144" widths as well as non-standard sizes with manufacturing lead times. 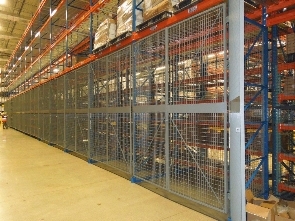 Panels are manufactured using 6-gauge, 2" square pattern welded wire steel mesh. Mesh is resistance welded at each intersection to insure overall product uniformity, strength, and integrity. 3/8" slotted holes are punched in a 1 1/4" x 1 1/4" x 1/8" steel angle frame, with joints mig welded. 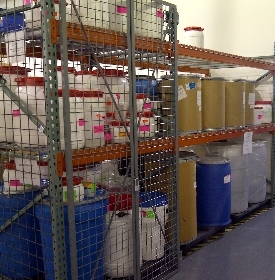 Hardware: All mounting hardware is provided and installation is available. Extension posts are available and extend 4' above height of upright.